You are currently browsing the Dublin Event Guide weblog archives for August, 2018. This week is slightly mental in Dublin. With the Pope taking over the City Centre and Croke Park and Phoenix Park, there is a good argument for staying AWAY from the City Centre. 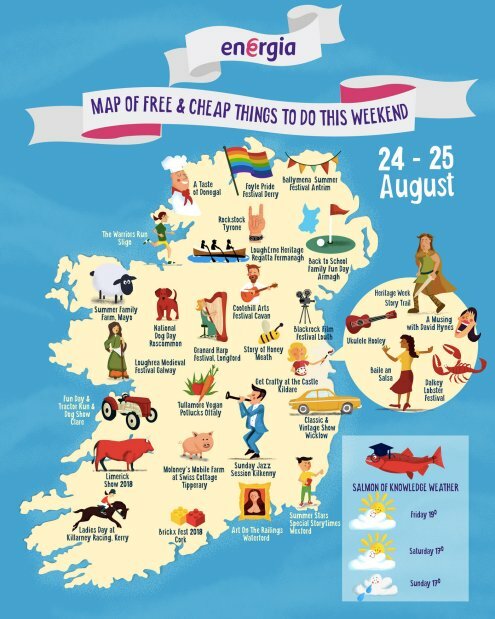 Luckily there are great events in Howth, Bray and Dalkey! Far enough away if you want to get out. If you are going to Croke Park or Phoenix Park, enjoy!! The pre-event organisation was a shambles, let’s hope that the actual events will be good for you! The August bill now stands at EUR 90 and the month is running out. I need your help to find these 90 before the end of the month! Please!! If YOU can support the Dublin Event Guide, please do so! I am suggesting a very fair EUR 12 for the year, that’s just 23 cent per Dublin Event Guide Edition or just about 2 pints for 52 (!) editions of the Dublin Event Guide! That’s not much if you think about how much value the Dublin Event Guide brings you every week! Higher and lower donations are also appreciated! Every Euro counts! Last week Marile K, Ornaigh G and Sarah H were so great to help with a very much needed donation. Thanks! Every cent counts and without all these contributions the Dublin Event Guide won’t continue. Eamonn U, Gerard Ph, Fiona F, Gabriel K, Laura C, Aislinn T, Barry M, Joan S, Nicole W, Tara R, Denise G, Ann M, Mairin M, Daire O’C, Anne H, Anne H, Comet Records, John F, Nora O’K, David O’K, Karen+Brian F, Estelle K, Ann McP, Noelle H, Pat M, Meav Ni M, Jutta B-S, Jamie C, Leigh Ph, Irene D M, Michael D, Joan S, Melanie B, Anita W, Maria F, Moira dF, Arthur D, Catherine G, Clodagh C, Elaine K, Majella M, Ann M, Clodagh O’C, Claire R, Leigh Ph, Sarah L, Mark G, Erzsebet H, Isidro G, Karen A, Sean S, Melanie M, Zelie McG, Lindsay R, Thibaut D, Pia O, James B, Marguerite D, Shai C, Susan K, Agnieszka S-S, Alice K, Ieva B, Ruth L, Ana RT, Rita B, Sueanne O’H, Rosemary M, Darragh D, Lorraine S, Helena S, Carija I, Pat McK, Jennifer R, Sophie P-L, Jenny B, Catherine F, Stephen S, Juliana A Y, Caoimhe NiM, Damien B, Shane O’B, Melanie S, Audrey H, Catherine E, Michele McN, Susan B, Sharon K, Bill G, Malachy B, Catherine O’S, Paula R, Pamela A, Eleonora P, Thomas B, Karen K, Brendan M, Eric O’F, Gale G, Daniel LG, Mark G, Margo C, Joan S, Debbie C, Karen McG, Eric C, Irish Family Names, Tom McM, Aishling B, Ana RT, Eamonn McG, Silja P, Nicola R, Jacinta O’B, Siobhan B, Orla P, Sharon G, Isidro G, Carmel C, Roisin R, Mona R, Suzanne D, Tracey O’C, Jessica G, Barbara L, Frances D, Emmet R, Irene C, Eugene McG, Stuart N, Laurie F, Joan S, Mark C, Clodagh O’C, Grace L, Peter D, Mona O’R, Maria J, Ryan M, Sharon B, Gennadii N, Tadgh C, Niamh D, Austin M, Belinda B, Brendan D, Cathie S, Margaret P, Eric C, Gerard B, Gareth G, Aine G, Lisa B, Rita B, Brendan McC, Dave H, Sarah D, Jutta B-S, Martin McN, Iulia A, Brendan, Mitzi D’A, Shay, Aideen, Sharon J, Julie O’S, Deirdre W, Leigh P, Sandra L, George K, Anita C, Anna Z, Judith B, P, Liam B, Justin M, Ross M, Daniel LG, Susan F, John F, Melanie B, Mark G, Tadhg C, Scott P, Marile K, Ornaigh G, Sarah H and Travel Agency “Project Travel” (www.project-travel.ie Ireland’s only Norway and Northern Lights Travel Experts), Arthur’s Pub (www.arthurspub.ie A classic Dublin old-style pub in 28 Thomas Street with a new and buzzing music venue that runs lots of events), Cycling Campaign (www.dublincycling.ie), www.cfcp.ie (The Centre for Creative Practices is the the only arts centre in Ireland dedicated to connecting, integrating and promoting immigrant, experimental and emerging artists among the local arts scene and audiences). If you are not going to the biggest event in Ireland in the last 39 years, the Papal Mass in Phoenix Park, but you live in Dublin, I would strongly recommend that you avoid ALL areas that are in 5-8km radius around Phoenix Park on Sunday. Up to 500,000 people are expected in Dublin and they ALL have to somehow get to Phoenix Park. Walks of between 2 and 7 km are required to reach the location for the mass, but since there will be a huge amount of road closures and also a take over of all public transport resources (trains & busses) to bring people to Dublin and then as close as feasible to Phoenix Park and Croke Park, I would really suggest you stay at home on Saturday and even more so on Sunday. There will be 52 road closures on Saturday in Dublin and 86 on Sunday, so renew your Netflix subscription, get a good book or restart that knitting project, make sure you have enough food and drink at home and then lock yourself in! The long-term forecast at the moment predicts a cloudy day with some sun on both Saturday and Sunday, but it is quite cold at 16 degrees! It must be hate for its customers, there is no other way I could explain the constant messing around with the rules for baggage. I can’t even keep up with it anymore and to keep it that way, I have to admit that I am going out of my way to avoid flying with Ryanair. Oddly, I like Ryanair – or at least what it had wanted to and did achieve. Without Ryanair we would still pay super high ticket prices for highly inefficient airlines. Ryanair got others to tighten their ship (or plane) to get more efficient and to reduce the profit margins. Thank you, Ryanair! But now they are changing the baggage rules again and it is ALWAYS getting worse for their customers. We never wanted to bring a huge suitcase on board, we would all prefer to check in our luggage, but Ryanair forced us to re-think. They thought that it would reduce cost for them because baggage handling at the airport is expensive. But people continually increased their bags (despite the bag size checker at the gate) to bring on board and that delayed planes. Then the told us that Priority customers can still bring their 10kg bag on board, but the rest had to hand it over at the boarding gate (initially they wanted you to check it hand luggage at check in – the contradiction! – , but that was changed) and only a Laptop-sized bag was allowed on board. But the handed over hand-luggage that was to be carried in the hold of the plane was not charged extra. Now the new change is that UNLESS you pay for priority boarding you will now have to pay for your hand luggage as well. Ryanair claims that they are making this change because planes are getting delayed because people bring too much hand luggage. This is TOTAL nonsense. Since there was a definite 10kg limit for ONE bag only, they can’t bring more than 10kg in one bag. So NO the planes are not delayed because of too much hand luggage. And the ONLY reason why we bring lots of hand luggage anyway is because Ryanair pushed us in the direction of the check-in-luggage-free flight. Dun Laoghaire Rathdown is the leading example in the whole Greater Dublin area of top class historical events for everybody and Dublin City really could learn from them! The Summer of Heritage programme of events is a series of more than 30 free guided tours run by the Heritage Office of Dún Laoghaire-Rathdown County Council from 25 June until 02 September. The tours are suitable for families, groups and individuals interested in local history and some of the locations/tours are The Oratory, Seapoint Martello Tower, Holy Trinity Church Kiliney, Historic Dundrum, Kill Abbey, Obelisk Stillorgan, James Joyce Tower, Historic Blackrock, The Metals, Dun Laoghaire Harbour Walk, National Maritime Museum, Dalkey Castle, Monkstown Castle. Eva Kelly is a Dublin based free­lance illustrator, educator and arts facilitator and her exhibition “Everyone, Everywhere, Everyday” is an illustrated journey through the north and south of inner city Dublin. Inspired by Ulysses, James Joyce, it traces part of the journey Leopold Bloom makes through the streets. Over eighty portraits of more than thirty renowned Irish cultural figures, completed over a sixteen-year period by the Anglo-Belgian painter Anthony Palliser, will be on display at Farmleigh Gallery. The “models” include Seamus Heaney, Derek Mahon, Paddy Moloney, Siobhán Armstrong, Thomas Kinsella, Edna O’Brien, John Boorman, Colm Tóibín, Nuala Ní Dhomhnaill, Brian Friel, Bill Whelan, John Banville, Sinéad Cusack, John Montague, Paul Muldoon, John Hurt and Garech Browne. Admission is free. Find more information here. The exhibition is open from 09:00-17:00 and there will be talks at 11:00, 13:30 and 15:00. From 18 August until 26 August the National Heritage Week 2018 will take place in Ireland. The intention is to create awareness and to educate about heritage in Ireland trough walks, talks, performances, exhibitions and workshops. Many events are repeated numerous times throughout the week and a large amount of events are free. Unfortunately, though you can’t filter out free events. (Another wrong decision!). One of the slightly quirkier events that runs for the whole week is the “Totally Terrific Tomato Festival” in the National Botanic Gardens. There will be exhibition of tomato cultivars and their relatives (tobacco, potatoes, chillies, petunias and even deadly nightshade) and there will be a series of talks, Tomato Tales, with tomato addict Nicky Kyle, and Director of the Gardens Matthew Jebb. Come to this guided tour of one of Dublin’s oldest buildings and find out more about its place in the history of medieval Dublin. Discover the hidden Portlester Chapel. the remains of a 13th century laneway and a monument to a Knight and his Lady. The Children’s Workshop “Growing Tomatoes” will take place at 11:00 and again at 13:00. Deirdre Doyle of the The Cool Food School will host this interactive workshop for children aged 8-11 years old, exploring tomatoes and how they are grown. As part of Heritage Week, there is an Open Day at the Irish Railway Record Society (IRRS) Library, Archives and Small Exhibits Museum of railway memorabilia in the former goods offices at Dublin Heuston Station. The IRRS was founded in 1946. It is a voluntary organisation dedicated to the study of the history and operations of Irish Railways. Six times this year the “People’s Art 2018″ exhibition will take place. It is an art exhibition on the rails/fence of St. Stephen’s Green. Visiting the People’s Art Exhibition is free and you will be able to admire (and buy) a huge amount of great art works from the artists themselves. The event starts close to 11:00 and typically finishes around 17:00, it runs from Friday until Sunday with the main activity on Saturday and Sunday. An LGBTQ+-themed tour will happen in the National Gallery. Join art historian Kate Drinane for a tour with a new perspective. Spend one hour exploring the history of gender identity through a selection of works from the collection that are connected to the LGBT community. Meet Trixie the giant T-Rex, Terry the Triceratops & Vinny the Velciraptor at this Dinosaur day out for all the family. There will be shows at: 12:30 / 14:30 / 16:30. Brazil Meets Bray 2018 is an afternoon of Brazilian and Irish food, song, dance & festival fun. Brazilians are now the largest immigrant group in Bray and to celebrate their culture and support their integration, The Brazilian Cultural Centre is running the Brazil Meets Bray Festival. There will be Irish dancing, a Brazilian “Forro” dance demonstration, a language exchange with Portuguese, English and Irish and the band Celtic Grace (13:00-15:00) and Samba Band Morro 16 will perform. A Brazilian Short Film Competition will be from 15:00-17:00. The Friends of Medieval Dublin invite to four “Walking Tours of Medieval Dublin” during Heritage Week. They will take place on 18+21+22+25 Aug. On the two Saturdays 18+25 Aug it is from 13:00-14:00 and during the week from 18:00-19:00. Admission is free, but booking is required via heritageweekfmd@gmail.com Meet at Barnardo Square, next to City Hall in Dame Street. Jungle animals (reptiles and snakes) will be on show in the Jervis Shopping Centre. Shows will take place at 13:30, 14:30 and 15:30. ‘In Defense of Horror’ is a lecture by Darryl Jones. Professor Darryl Jones’s main area of research and expertise lies in the area of popular literature, particularly in the fields of horror fiction and film, and of Victorian and Edwardian adventure fiction. He has published and edited many studies in these areas, including his ‘Collected Ghost Stories of M. R. James’ (2011), and his ‘Horror Stories: Classic Tales from Hoffmann to Hodgson’ (2014). Admission is free, but booking is recommended via the link below. Admission is free. No artistic ability required. All materials provided. This will be a tour of the building and grounds of the Headquarter of the Law Society. You will be shown how the vision of the original Architect Thomas Ivory was realised and how the building has been adapted for modern use. The Treasures of the Bog Trail is a Drop-in activity for children aged 8+. Admission is free. Bogs are fascinating places for archaeologists. Take part in the Treasures of the Bog trail to learn more about the unusual artefacts found in bogs, from butter, to books and even an entire boat! Uncover the secrets of Ireland’s wetlands then make a bog armlet treasure of your own to take home. Located in Kildare Room Ground Floor. The Pope will be driven in the Popemobile from Marlborough Street (St. Mary’s Pro-Cathedral) to Church Street (to the Capuchin Centre) on a “scenic route” throughout Dublin to greet up to 100,000 people that are expected to line the street. But you have to be there on time, because he is finishing the 3km trip in expected 15-25 minutes. The route will go south on O’Connell Street, across O’Connell Bridge, then into Westmoreland Street and Dame Street to pass by Christchurch Cathedral, then down Bridge Street and across the Liffey into Church Street to the Capuchin Centre. A route map can be found here. Pope Francis will meet with homeless families there. A meeting entitled “A message to the Pope: We are going to Separate Church and State” organised by People Beore Profit will take place. Teenage Rock band “Boom Child” will play a gig in Sin E.
The outstanding Mutefish will play a gig in the Harbour Bar as part of the Harbour Roots Festival. Rock Tribunal are playing a weekly gig in the Porterhouse. 10:00-11:30 Tolka Valley Park – Supported by Dublin City Council and admission is free. Contact Turtle at education@owls.ie to book a place. Come to this special creative workshop organised to complement the exhibition “Roderic O’Conor and the Moderns – Between Paris and Pont-Aven”. Work together to creatively respond to the exhibition. Inspired by the exchange of ideas and practices at the artists’ colony of Pont-Aven, artist Fiona Harrington will lead this intergenerational strand of programming at the Gallery. The “Best Little Market” with creative wares, bric-a-brac and vintage goods etc will be back in Irishtown. The yearly Ukulele Hooley will take place again in the People’s Park in Dun Laoghaire. It is a great, goot atmosphere, family-friendly festival that focuses on Ukulele music. Unfortunately the festival has been very unfortunate with the weather in numerous years before, so let’s hope it will be better this year. There will be a 6 hour long concert with international Ukulele performers and this will incorporate the “Big Jungle Ukulele Jam” from 15:00-16:00 where everybody in the audience is explicitly invited to play along. The organisers would love to have 1000 Ukulele players in the park for this jam, so tune your Ukulele, practise a few chords and come along. At 15:00 there will also be a Children’s Workshop in People’s Park, which is free. Admission to the Ukulele Hooley is free. Another protest against the Pope’s visit has been announced for Sunday and it seems that this is now a meet-up and march from the GPO to the Garden of Remembrance where the “Stand for Truth” protest will take place. The protest at the GPO has a significantly longer list of issues they protest against, but you have to scroll by a loooong justification for why this group suggested people should get tickets to the Phoenix Park mass but not use them. At the bottom of the Facebook events page is the list of issues they are protesting against. As for all protests, admission is free. The “Recovered Voices” Tour will explore the experience of Irish men and women during World War I. “Stand for Truth” is protest for everybody harmed or abused by the Catholic Church and for people who support the people that have been abused. Admission is free, but I guess that is clear. The Harbour Roots Festival in the Harbour Bar this weekend in Bray has a great line-up and admission to all gigs is free. Two years ago, Peter Varga began to walk the streets of Dublin interviewing and photographing the peole he met along the way, uncovering powerful and stories that often hide in plain sight. Humans of Dublin’s social media pages have over 175,000 followers. Peter will share his story of the social media phenomenon that is Humans of Dublin. A meetup for everybody interested in “Electronics, Microcontroller and IOT” will take place in the TOG Hackerspace. Everyone from absolute beginner to experienced is welcome to this informal evening. Come in with your Pi, Arduino, Galileo or whatever you have. Bring your laptop. Maybe you want to make something, solder, breadboard or use our electronic gear. Maybe you have some vague ideas and just want to get started, but you’re not sure how to. Or maybe you’re just curious……if so, it’s fine to come along and just see what others are doing. The Leeson Lounge will feature the Urban Mojo Blues Band on Monday. The National Botanic Gardens run “Kids Drop by Activities” every Tuesday until 28 August. Rosary Cox will give a pop-up talk about Jack B. Yeats’s painting “Grief”. Meet in front of the painting in Room 14. Ben Provo will play his regular “Bourbon & Blues” gig. A Pop-up sketching session, inspired by Kees van Dongen’s painting “Stella in a Flowered Hat”. In this session you will explore chalk pastels and all materials will be provided. Admission is free. Meet in front of the painting, in Room 5. Limited to 15 participants and places are allocated on a first-come, first-served basis. Have you ever wondered how to get started editing Wikipedia? Come along and you will get to add to the world’s largest open collaborative knowledge project. All are welcome, no editing experience is necessary and the event is free, just turn up with a laptop to start editing. Pizza and WiFi will be provided. This is not a formal workshop, but an informal evening with an experienced Wikimedia editor on hand to help. You can also learn how to edit the huge linked database Wikidata, or add images to Wikimedia Commons. Details are on the website below and admission is free. The August Inn Jokes Comedy night will _most likely_ happen tonight. I wasn’t able to find an announcement but since it usually takes place on the last Wednesday, it should be today. MC and organiser is comedian Colm O’Regan. The guided tour “Celebrating Seamus Heaney” will take place at 11:30 and at 14:00 and will last 1 hour. It will commemorate the anniversary of Seamus Heaney’s death by exploring Heaney’s life, work and legacy. The In Focus Tour “Miniature Masterpiece: The Coëtivy Hours” will take place in the Chester Beatty Library with Dr Jill Unkel, Curator of Western Collections, Chester Beatty Library. The Pop-up talk “La Montagne Sainte-Victoire” will be about Paul Cézanne’s watercolour “La Montagne Sainte-Victoire from Les Lauves, near Aix-en-Provence”. Mary Dowling will give the talk. Meet in the Atrium. Admission is free. Limited to 15 people. Spaces are allocated on a first-come, first served basis. Ríona Sally Hartman is the first Musician in Residence with Dublin City Public Libraries. Ríona and The Music Library are looking for young adults who want to make music. Over the course of a few months Ríona will guide them from start to finish in writing, playing, recording and performing their own songs. Whether you like to sing, play an instrument, rap, write lyrics or produce you are invited to meet Ríona, find out more about the project and see if you would like to sign up for more. The Young Adults Band in Residence will meet weekly, some music experience would be great but not necessary, if you do play an instrument please bring it along. “The House of Oscar Wilde (as imagined by Arthur Cravan)” is an art project presented by the Trinity Oscar Wilde Centre for Irish Writing in Dublin. It is a mise en scène based on Cravan’s description of Wilde’s House in London and the exhibition venue is 21 Westland Row, where Wilde was born. The space in the building is very limited, therefore you need to book your entrance via the booking system here. The exhibition is accessible on weekdays from 30 Aug – 06 Sep. If you want to see the art project on the day of the opening, you have to book your tickets here. Admission is free. Access to 21 Westland Row is through the Panoz Institute on the TCD Campus. Rake The Ashes will play a Trad Music gig in the Harbour Bar. Hugh Buckley and Dave Whyte, two of Ireland’s best guitarists are playing a gig in the upstairs bar of Neary’s Pub. They will play a mix of jazz, pop and originals. Scott Maher will play a Roots/Americana gig in the Harbour Bar. At the next Culture Club event in Collins Barracks Dr. Alison FitzGerald will talk about the making and selling of silverware in Georgian Ireland. The tour will examine what these objects meant to those who bought, sold and coveted them during that period and will investigate how changing fashions in dress, dining and elite sociability influenced the types of silver objects that were in demand. The space in the building is very limited, therefore you need to book your entrance via the booking system here. The exhibition is accessible on weekdays from 30 Aug – 06 Sep.
Crooked jack will play a Trad music gig. Markas Carcas & The Trail Gang will play a gig in Sin E.
Misguided Pope Outrage! Focus on the real issues! Interesting, these complaints about the Pope’s visit! There is a level of outrage on Facebook that starts getting overboard. I don’t have a problem with people not being keen on the Pope or the Catholic Church or this event. I myself am not a big Pope fan and I won’t go to Phoenix Park or Croke Park, but I have an issue with lies and half-truths, just to justify a bigger “amount” of outrage. 1) The horrible pope is costing us 32 mio. taxpayers money. 2) Nobody wants to see the Pope, but he will cost us lots of money. It is indeed estimated that the visit might cost 32 mio, although nobody really knows yet the exact amount. Of the 32 mio I read that 20mio, the Catholic church is paying and the rest is paid by the state. So then it is 12mio instead of 32mio! In addition, the 32mio is not that huge in comparison to recent state visits: When Obama and the Queen where in Ireland, the combined visit did cost 36mio and of that amount about 15mio were paid DIRECTLY to the Gardai. Interestingly, most of the 32mio will be paid to people and for services or products in Ireland, so that means the money is staying in the economy and then cycling money is often an important process to stimulate the economy. And why is the whole thing costing that much, well because close to 600,000 people have to be accommodated and a international guest has to be protected. Look at it this way: The promoter of a big “popstar” has discovered that there is an audience that wants to see that performer. The promoter is certainly keen to run the gig and bring the performer to the country. If no one had requested tickets, there would be no gig in Phoenix Park! When the invite went out at least 500,000 tickets were requested and this is a lot more than “nobody”. Now protesters will tell you that they all have requested 12 or 24 or thousands of tickets and have no intention to use them. You could argue that this is not very tolerant and open minded, but let’s look at it from a different angle. If we assume that the cost of the visit is 32 mio and 600,000 tickets have been given out, then the 24 tickets a protester might have secured will cost 24 x 53 Euro. So complaining about the cost and sitting on tickets sounds a little hypocritical. If the fans buy up all the (free) tickets, then the promoter has to prepare for a BIG gig. He can not assume that half of the fans won’t appear. 3) Because of the Pope homeless people will have to stay off the streets over the weekend. Actually I would be surprised if the Pope had requested or even demanded that!! But maybe it is our government who doesn’t want to seem to have nothing done in that area. So why are people criticising the Pope over the homeless situation this weekend and not the government? Yes, I know, the 32 mio could have helped a few homeless, but it is not that we would provide housing for everyone if these 32 mio hadn’t been spent. Last year we didn’t know yet that the Pope would come and we still didn’t spend 32mio or even 2 additional mio. It is not the Pope’s fault that the money is not spent where it is needed. 4) It is the Pope’s fault that I can’t get out of my house on Sunday. Ohh, did he make the plans for traffic diversions and restrictions? Sure if he didn’t come, there would be no traffic restrictions, but the traffic restrictions are caused by the large amount of people that MIGHT come (including the unused protester tickets!) and also by the Gardai in Ireland. Not by the Pope or by the Church! Oh and by the way, the Phoenix Park neighbours who complain so loudly should just for a GAA weekend swap with people around Croke Park to realise how good they have it ALL year every year apart from the odd Pope visit every 40 years or so. There are LOTs of things you can have a serious issue with the Catholic Church over, but people should stick to the real issues like child abuse and hypocrisy and the attitude to women and LGBTs etc. Yes you can get outraged about all that and you have every right to be. But getting outraged with a person or an organisation over nonsense like road closures etc is just weakening the correct and important discussion about all the other issues.